In simple terms our ‘Integrated Air Control’ is a Variable Frequency Drive mounted directly onto the blower drive motor. 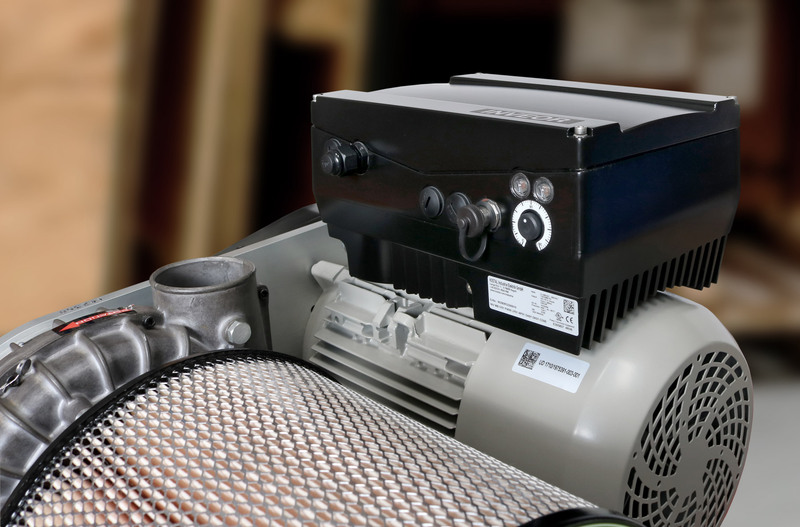 Provides variable performance control of the blower output. Simplifies the electrical installation of the blower with a single power supply connection being the only requirement. Reduces electrical installation costs for both equipment and labour. Available across the full range of blowers from 2.2kW upto 15kW. As the ‘Integrated Air Control’ is installed directly on the motor this minimises wiring and installation work, therefore reducing project planning and installation costs for systems covering large areas. As dedicated control cabinets are no longer needed the Air Blower system can be easily moved around the factory/facility or used in places where space is at a premium. The individual units can be fully pre-wired, pre-tested and standardised. Energy efficiency ‘Integrated Air Control’ drive controllers also satisfy the most stringent requirement of the ECO design directive EN-50598. For more information on our new ‘Integrated Air Control’ system please contact us. We will be releasing further details on this product shortly.